We’re here to brighten up your holidays!!! Christmas can be a very hectic time of year with parties to attend, shopping to finish, buying a tree… on top of everything else life throws your way. Hanging your Christmas lights can be a time-consuming headache on top of it all! We offer a professional holiday light hanging service. We take away the hassle of figuring out what supplies you need, tangled lights, broken bulbs, and the danger of climbing on ladders and roofs. 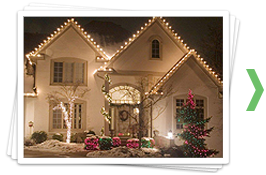 Our service includes providing all lights, supplies and equipment needed to decorate your home as you wish. We are also happy to provide decorating suggestions and designs. Once hung, we guarantee our lights to work for the duration of the season. In January we return to remove and package your Christmas lights to be used again the following year. Our lights carry a 3 year guarantee! We also provide professional holiday lighting for businesses/commercial properties. We can help generate holiday spirit and attract customers. We are more than happy to answer questions or visit your home or business to provide a FREE estimate with no obligation. Please call or email early, our schedule gets extremely busy. Ernesto Espinoza, originally from San Diego, graduated in 2000 from Ohio State University with a degree in Zoology. Soon after graduating, he moved to Atlanta with his wife Cindy and worked in the insurance and financial services industry. For the past 15 years Ernesto and his team have been lighting homes and businesses throughout the Metro Atlanta area. Call to schedule an early appointment, as spots fill fast!!! Contact us today to learn how we can make this coming holiday the best ever!